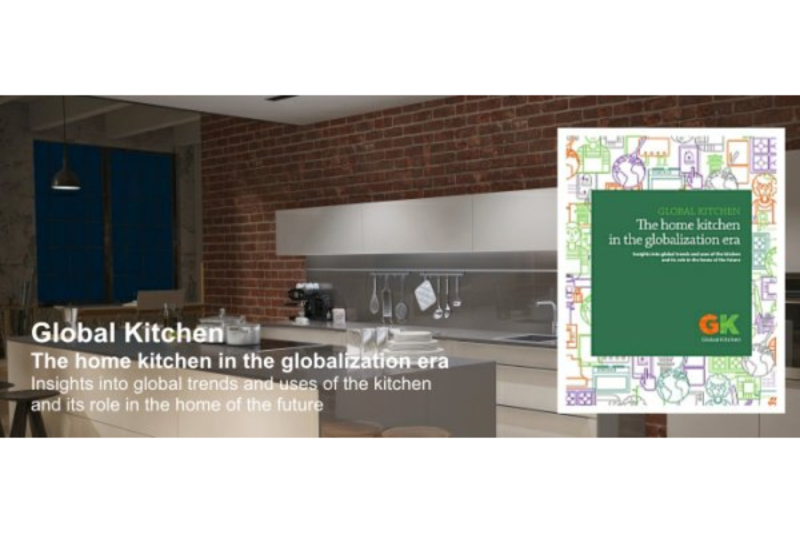 The report, entitled ‘Global Kitchen: the home kitchen in the era of globalisation’ is the result of a collaboration with 17 distinguished experts from the worlds of design, cooking, domestic technology, sociology, nutrition and sustainability. In addition, a survey carried out in over 800 kitchen studios across the world provides data on the importance consumers afford to this room in their homes. Key experts included chefs Andoi Luis Aduriz (**Michelin in Mugaritz), Gaston Acurio, Harvard anthropologist, Richard Wrangham, architect Piero Lissoni and industrial designer Patricia Moore. The kitchen will be a hyper-connected, multi-functional space for work, leisure, health and relaxation. It will incorporate techniques and smart devices normally found in professional kitchens such as vacuum cooking and packaging. It will further cement its role as the ‘centre of the home’; the largest and most invested room in the house. The kitchen will develop as a multi-functional space in all countries and is expected to disappear as an independent room. Its design will not only take aesthetics and function into account but also emotional value and it will strengthen its use as a space for relaxing and well-being. Connectivity and smart appliances will be managed from mobile and wearable devices and will not only make shopping and laundry easier, but ensure endless access to information from the Internet of Things. The worktops will be able to cook, make calls, broadcast TV or provide access to the internet. They will be height adjustable, contain recipe databases where chefs will guide the user through the method, ingredient information and be able to weigh food. The refrigerator will offer permanent access to nutritional information on screens. They will be sustainable, with appliances solar powered and will be aligned with ‘Multi- R’ thinking – Rethink, Redesign, Repair, Reuse, Remanufacture, Recover. Intelligent lighting will be variable to match the time of day, mood or the type of food being cooked. 87% of respondents said that the kitchen would become more relevant as an activity and meeting place in the house. (In many countries, the kitchen is a separate room). 5% said that it will be a single space combining dining and living rooms. 3% said it will be used to get together with family, to work and do homework (60.9%) and surf the internet (62.4%). 1% expect cooking will be directly on the work surface. 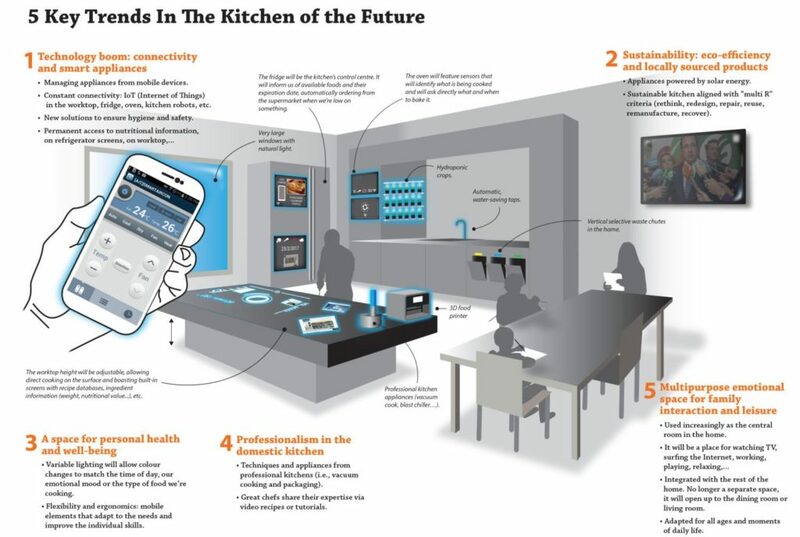 7% predict that the work surface will integrate a control panel for appliances with access to the internet and device connection. 3% imagine the work surface will incorporate weighing scales and nutritional analysis. Australia and Brazil agree that the new cooking methods will be the most important development, while the UK and Italy prefer smart appliances. In contrast, Spain and the US value connectivity above all.